Success! 1.2 Million Miles in 2015, 8 Countries Visited So Far in 2016! 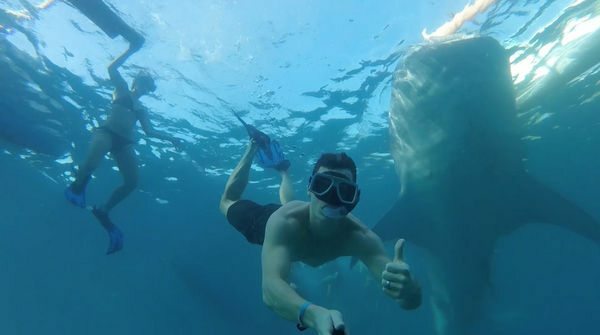 Here’s Nate Swimming Below a 20+ Foot Whale Shark in Oslob, Philippines! Nate is our newest reader success story to show folks it’s possible to travel without spending a lot of money. A big thank you to Nate for sharing his story! My name is Nate Buchanan. I’ve been collecting miles & points for the last 3 years. My wife Kara and I have earned and redeemed millions of frequent flyer miles. We’re currently using the 1,500,000+ miles & points we’ve saved up to travel the world full-time! I got into miles & points the same time I got married. My wife and I share a passion for travel. In the first 2 years of marriage, we used miles & points to visit 9 different countries! Nate & Kara Stayed at the Marina Bay Sands Hotel in Singapore With Barclaycard Arrival Miles! The more we traveled, the stronger our passion grew. In early 2015, we decided to we wanted to take a leap and travel for (at least) an entire year! 2015 was spent planning this adventure and saving up miles & points. 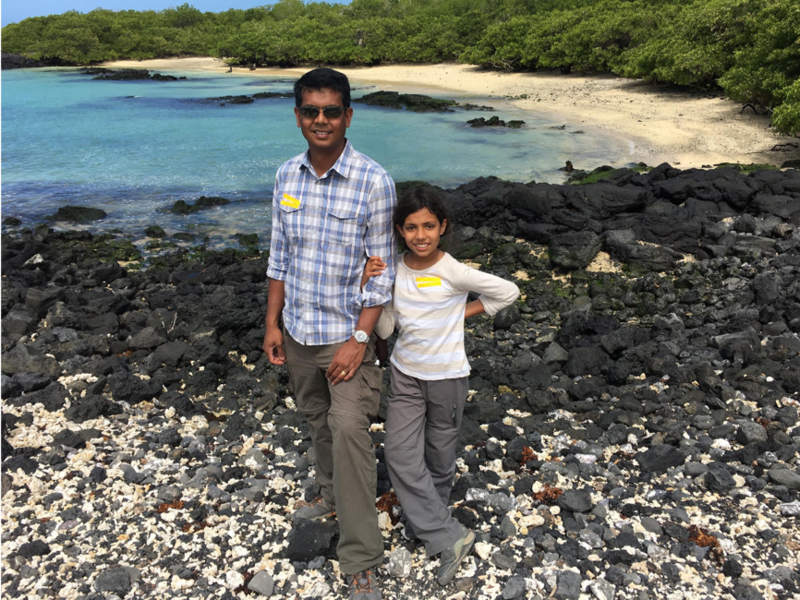 We left for Japan on January 10, 2016 – our 1st of 25+ countries. In our first 2 months, we’ve already used our miles & points to visit 8 different countries! At the beginning of 2015, before we decided to travel for a year, we’d saved up over 500,000 miles & points between several different programs. Nate & Kara Earned Over a Million Miles & Points in 2015! 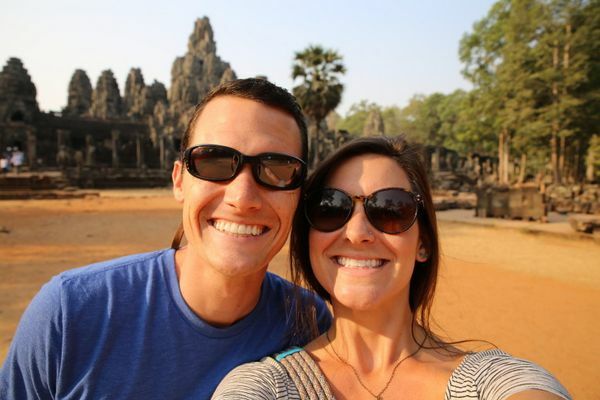 They Used Them to Visit New Countries, Including Angkor Thom in Siem Reap, Cambodia! We got serious about earning miles in the beginning of 2015 after deciding to take our trip. Between the 2 of us, we earned over 1.2 million miles and points in 2015. My wife earned 295,000 points from credit card sign-up bonuses. And I earned about ~950,000 points using 3 different methods. First, I earned 430,000 miles & points from credit card sign-up bonuses. I also own my own business, a custom apparel and promotional products company. Second, I purchase EVERYTHING on my AMEX Starwood credit card. I earned ~200,000 Starwood points from business spending in 2015. Nate Flew for 2 Weeks to Earn Enough American Airlines Miles for Full-Time Travel! 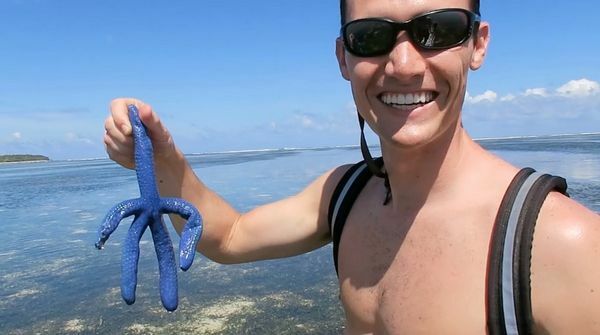 But It Was Worth It to Find a Blue Starfish While Exploring Tidal Pools in the Philippines! The 3rd and most unique way I earned miles in 2015 was from a 2-week, 92,000-mile mileage run. I lived in airports and on airplanes for 2 weeks while flying back and forth 3 times between Sao Paulo, Brazil, and Hong Kong. During the trip I slept on airplanes 14 of the 15 nights I was gone. It was INSANE. 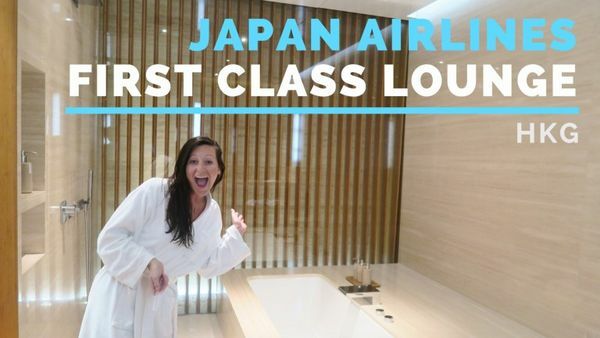 Thankfully, I was flying Business Class due to a mistake fare, so I was able to fly in luxury for 2 weeks! This mileage run netted me 313,000 American Airlines miles. And I earned Executive Platinum elite status AND oneworld Emerald Status – which have been extremely valuable during our travels this year – more on that in a bit! Because the majority of our points are in the oneworld alliance (including American Airlines and British Airways), I usually search for award flights on AA.com or BritishAirways.com. 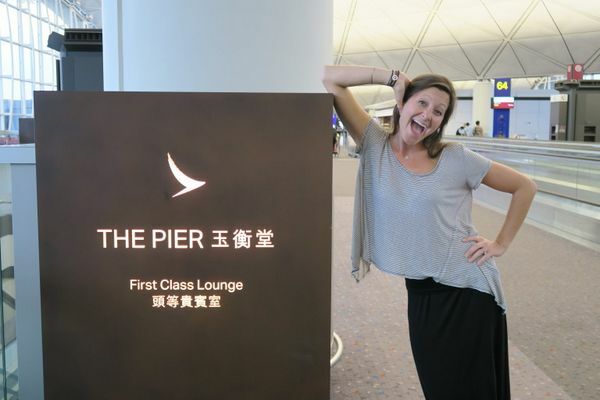 Kara Is Always Excited to Spend Time in the Cathay Pacific Pier First Class Lounge! Nate Earned Elite Status on American Airlines, Which Allows Him to Bring a Guest. And They Flew on Cathay Pacific Using British Airways Avios Points! Using AA.com, I was able to find a 1-way off-peak coach award flight to Japan for only 25,000 American Airlines miles! Unfortunately, this route will get more expensive with changes coming to American Airlines’ award chart. Since the first 2 months of our trip have been spent in Asia, I’ve been using the British Airways website to search for award flights between countries here. We’ve been able to get a TON of value out of our British Airways Avios points by using their distance-based award chart. For instance, we flew Japan Airlines Business Class from Tokyo, Japan, to Cebu, Philippines, for 20,000 British Airways Avios points. Had we used our American Airlines or United Airlines miles, it would have been almost the same price to fly in coach! Also, we’ve been using the British Airways website to find Cathay Pacific award flights that transit through Hong Kong. With my oneworld Emerald Status, we get access to the AMAZING Cathay Pacific First Class lounges in Hong Kong. I book LONG layovers on purpose so we can spend more time in the lounges! We’ve used a combination of Airbnb, hotel points, and Barclaycard Arrival miles to minimize the costs of our accommodations during the first 2 months of our trip. When we can’t use hotel points, we 1st look to Airbnb for budget accommodations. If we can’t find a place to stay on Airbnb we usually book a hotel through Agoda or booking.com. Thankfully, we both have Barclaycard Arrival miles. So after booking with our Barclaycard Arrival Plus World Elite Mastercard, we can redeem our Barclaycard Arrival miles to pay for the stay. Our best hotel points redemption so far has been at the DoubleTree by Hilton Hotel Kuala Lumpur. Before we left, I signed up for the AMEX Hilton Surpass card and met the $3,000 minimum spending requirement at our local grocery, because you get 6 Hilton points per $1 spent at supermarkets with the AMEX Hilton Surpass card. Between the signup bonus and the bonus points from meeting the minimum spend, I earned 95,000 Hilton points. The DoubleTree by Hilton Hotel Kuala Lumpur is really nice, and sits right by the Petronas Towers (an awesome location). And it only costs 10,000 Hilton points per night because it’s a Hilton Category 2 hotel. We redeemed 50,000 Hilton points to stay there for 6 nights (because you get the 5th night free on award stays when you have Hilton elite status). The AMEX Hilton Surpass card also gives you Hilton Gold elite status. My Gold status got us an upgrade to the Executive Floor which included lounge access – where they have free dinner and a happy hour every night! Plus, we got free breakfast in the lounge every morning. It was AWESOME! The most challenging part of the trip wasn’t saving the miles & points, or figuring out how to redeem them. The most challenging part was getting our lives in order to leave for a year. There’s never a good time to pack up your life and leave for a year, but if you make the commitment and then start telling other people you’re leaving, the social accountability will force you to keep moving forward with your crazy plan! Since we started traveling, we’ve been to 8 different countries. I’ll give you 1 recommendation from each. 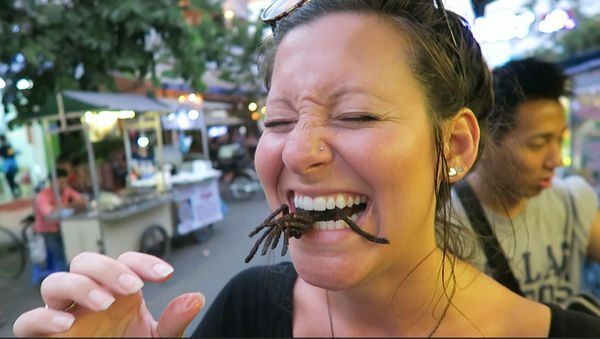 If You Visit Cambodia, Kara Recommends Trying the Tarantula! Tokyo – Go during SUMO season and attend a sumo wrestling tournament at Ryoguku Stadium. Get there early (around 8:00 am) to get a cheap general admission ticket before they sell out. Watch the 1st few matches. You’re allowed to leave once and re-enter, so go grab some Sumo Soup (chanko-nabe) down the street, and get back in time for the more intense night matches! Philippines – Oslob, Cebu, is 1 of the best places in the world to swim with whale sharks. These 20-foot long creatures hang out there year round, so you’re almost guaranteed to see them. We swam with at least nine! Singapore – A foodie’s dream destination. We loved eating at the Hawker Centers around town (especially in Chinatown). For an authentic Indian food experience head to the Azmi Restaurant in Little India. Hong Kong – There is pork bun stand on the corner of Pak Hoi Street and Shanghai Street. They make the best pork and onion buns in the world! I will plan another trip to Hong Kong just to eat at this place again! They even invited us back in the kitchen to watch. Taiwan – Take a day trip off the beaten path to the mountainous town of Wulai about an hour outside of the city (less than $2 bus ride). You can visit an amazing water fall, soak in the hot springs, and sample the local aboriginal cuisine. Malaysia – The DoubleTree by Hilton Hotel Kuala Lumpur is 1 of the top Hilton redemptions in the world (in my opinion). The value you get for only 10,000 Hilton points is unreal! Cambodia – Don’t waste your time fighting the crowds to see the sunrise over Angkor Wat. 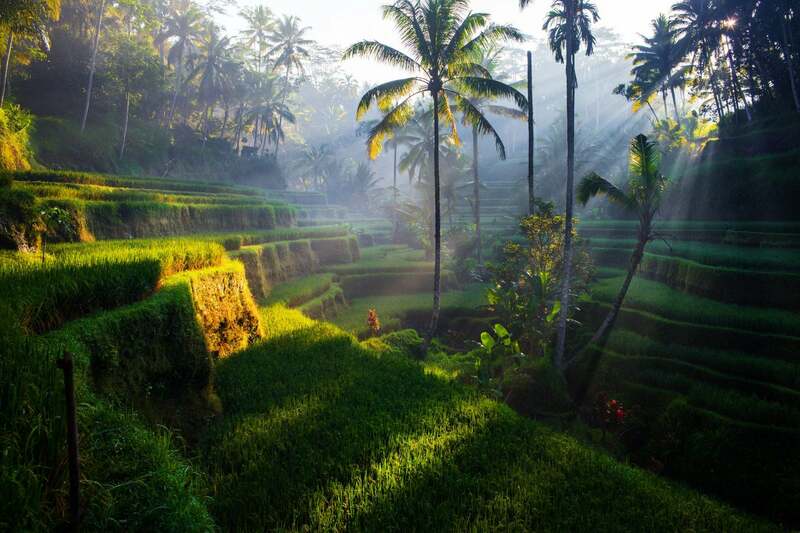 Instead wake up just as early and head to some of the less popular temples to have them all to yourself! Thailand – Koh Tao island is 1 of the cheapest places in the world to dive! For $60 per day, my wife and I were able to pay for accommodations, plus 1 dive each! We’re learning new things about ourselves everyday. One of the things I’ve learned on this extended trip is I enjoy the process of traveling almost as much as I enjoy the destinations. I look forward to the days we travel between countries. I’m always eager to experience new airlines and explore new lounges at airports I’ve never been to before. Make the sacrifices necessary to travel for an extended period time. You won’t regret it! Once you’ve made the commitment to yourself that you’re going to do it, tell everyone you know so you can’t back out. There will be plenty of obstacles and excuses that will arise while you’re planning your trip, so it’s good to have people holding you accountable! Also, start getting serious about miles and points well before your trip. Sign-up for numerous credit cards to earn the sign-up bonuses! Miles and points can help make full-time travel a reality, even if you have a very small budget! Thanks to Nate and Kara for sharing their story. We’re daydreaming of doing this with our kids within the next 5 years. @millionmilesecrets thanks for sharing my story! If anyone would like to follow our journey, we’re document our journey via daily vlogs on YouTube! @roy lots of other countries and continents coming later this year! SE Asia is the just the start! @a$]-[u thanks for the kind words! Last year we realized there would never be an easier time to do it, so we decided to start planning and make it happen! @lively glad you enjoyed it!